Looking For Trade Advice Or Second Opinion? Breadcrumbs: Home » About Me & My Strategy » Looking For Trade Advice Or Second Opinion? Every week I receive dozens of requests from readers asking for specific trade advice. Many of the questions revolve around do I think this or that trade would be a good idea. I am also asked quite often about specific stocks and specific option trades and in particular which option strikes do I think would be good to sell or to buy and how to rescue a losing trade. I am not a financial planner, broker or guru, just a small investor. If you have a specific trade question and are looking for a second view point or trade suggestion a normal response takes about 3 hours of work to research, some a bit longer and you may have follow-up questions. For this I ask for a tip in my paypal tipjar of $25.00. If you want to proceed with a question, please contact me here and I will see what I can do. Don’t put the tip in right away. Wait until I review your question and make sure I can offer constructive advice. 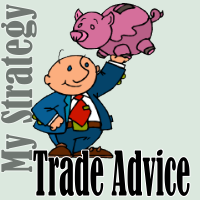 I will contact you via email and advise you whether I can offer any kind of trade advice on your question and then you can decide whether to use the tipjar or not. Remember every investor has their own goals, objectives, levels of investing comfort, risk aversion and capital needs. Investing in stocks is incredibly risky. Stocks are called risky assets for very good reasons. Many investors have lost large amounts of capital by investing in stocks and many have invested without having established plans, goals, objectives and paper traded to learn how to implement different strategies. I set up my website, www.fullyinformed.com to present my ideas and the strategies I have used for many years. My hope is that through presenting my ideas, other investors will contemplate their own goals and objectives and begin to develop their own strategies. I also hope that my website will get investors thinking about the very nature of investing in stocks and understanding the risk versus reward that is inherent in investing in stocks. I have a lot of investor friends and every one of them has a different outlook on investing. From reading through my website, I am sure every reader can see that I take investing seriously and I have traded within specific stocks such as Clorox, Coca Cola, Royal Bank of Canada and others for years. I don’t do penny stocks and the latest hot stock. My approach is to stay with large cap, blue chip companies that I believe will stand the test of market volatility and ecnomic recessions. If you want a second opinion on a trade, strategy or stock, I have to take time to study that stock and your question before replying to you. Remember my disclaimer when reading my site and asking for advice. In the end the responsibility for your investing rests with you. Trade at your own risk. If you have a specific stock question and are looking for a second opinion and understand I accept no responsibility for your trade and my answer, please contact me here.